I deleted a client user and tried to add as a project user but could not do so? Can I delete a project user and add him/her as a client user and vice versa? I got an invite mail but project portal denies access for me? Being a client user I am not able to see the tasks of a project? Is it possible to modify or define user roles? If I delete a user, what happens to their tasks or bugs? Who is a viewer and how do I add viewers to my project ? Why am I not seeing the Resend Invitation link for all the users that I have added in my project ? Can I associate my clients with multiple companies? How do I import users from CRM? 1. I deleted a client user and tried to add them as a project user, but could not do so. Why ? The message user already added as client to this organization is displayed because you would have deleted (removed) the user only from the project and not from the entire organization. You must delete the user from the organization, to add them again as a user. Learn More. 2. Can I delete a project user and add him/her as a client user and vice versa? Yes. You can delete a project / client user and add them again as a client / project user. Learn More, to add a client user. Learn More, to add a project user. 3. I was invited to join a portal but could not find the invite mail? The invite mail is a system generated mail sent from Zoho Projects along with username and password. Sometimes this mail would have landed in your SPAM folder. Hence we request you to check your SPAM folder for the invite mail. If you are not able to trace the mail kindly mail to support@zohoprojects.com for further assistance. 4. I got an invite mail but project portal denies access for me? The user who invited you to their portal would have forgotten to add you as part of their project, hence the access is denied. To get an access, you need to request your portal owner to add you as a member in their project. 5. Being a client user, I am not able to see the tasks in a project? You cannot access the tasks in a project since the milestone/tasklist to which the task is associated with is not marked as External. Learn More on how to change the milestone flag. 6. Is it possible to modify or define user roles? Yes. You can create and edit user roles based on business requirements. Learn more. 7. If I delete a user, what happens to their tasks or bugs? If you delete a project user, all their tasks, bugs, and other project activities will still be available. And the Portal owner can assign it to another project user. 8. Who is a viewer and how do I add viewers to my project ? Say, you are viewing a public project frequently where you haven’t been added as a user yet. In this case, you will be considered as a VIEWER of that public project and your details will show up in the ‘Viewers’ tab when any of the ‘Admin/Manager’ role users of the project login. Hence, unlike adding a user to your project, you cannot add a viewer to your project. Instead, users can view a public project even if they are not part of that particular project and become viewers of that specific project accordingly. Learn more. In Projects, select the Public tab to view the list of public projects in the portal. Click any one of the projects that you want to view. In the Users tab, the user will now be considered as one of the viewers in that project. 9. Who is a follower and how do I add followers to my project ? Say, you have started following a PUBLIC project recently and you are not the user in the project as well. In this case, you will be considered as a FOLLOWER of that public project and your details will show up in the ‘Followers’ tab when any of the ‘Admin/Manager’ role users of the project login. Hence, unlike adding a user to your project, you cannot add a follower to your project. Instead, users can follow a public project and receive real-time project updates. Learn more. Click Follow to follow the particular project (You can follow 'n' number of projects in the portal). In the Users tab, the user will now be considered as one of the followers in that project. Viewers and Followers cannot be added to a project. If the project is flagged with public access then all the users in your portal will have View or Follow access. The users who View / Follow the project will be identified automatically as viewers/followers. 10. Why am I not seeing the Resend Invitation link for all the users that I have added in my project? 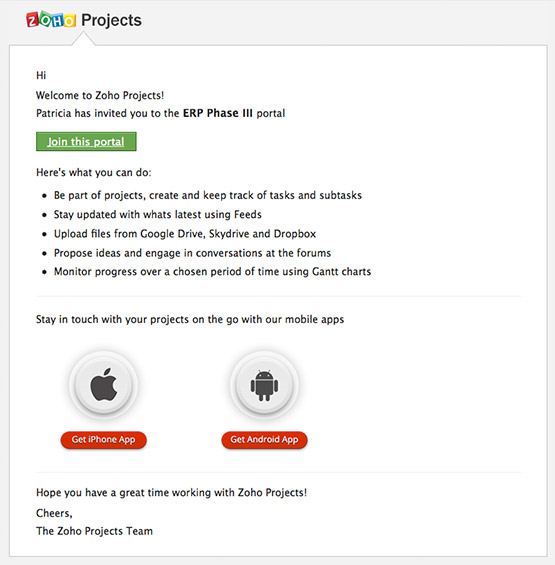 The Resend Invitation option will be displayed only for the users who have not logged into Zoho Projects account. If you have used the link to resend the invite, then it would show up again after 24 hours only. i.e. This Resend Invitation option can be used once in 24 hours from the time of using it. 11. Can I associate my clients with multiple companies? No, you cannot associate clients with multiple companies. 12. I need to add multiple users for the same role at one time. Can I do this? In Projects, click Users and select Add User. Enter the email id's of the user's whom you want to include in the project by separating every email id with a comma. Click Add to add the users to your projects. You can also add multiple users from the Home page in the All Users tab. You cannot assign different projects and roles for these multiple users. 13. How do I import users from CRM? In the Users tab, click the Other Actions icon and select Import from CRM. Enter the details and import users from Zoho CRM.